This year I attended AkiCon in early November. It's a Anime Convention in Bellevue WA. It's still a bit of a baby so a little small, but still filled with cosplayers and anime fans. Here we've got Taichi and Yamato from the first Digimon series. Don't forget their Agumon Digimon with them. What was cool about AkiCon that I've never seen at any other cons yet was they had a dedicated Cosplay Hall room which was a bunch of sets in which people could go take pictures in a awesome background. Here I'm in a Japanese garden, there was also a Casio, Winter Wonderland, and an Alley with grafitti. So Aki-Con staff was going around telling us to go get pictures with Johnny Yong Bosh (The GREEN POWER RANGER from the second series). But I was so confused becuase this guy looks WAY too old to be him. So when I got home I looked up the guest. This is actually Robert Axelrod who played Lord Zedd and Finster, two main bad guys from the first series of Power Rangers. That's actually way more cooler to me because I only watched the first series. Oh the guy on the floor is my friend Chris, if you recognize him, um I"ll leave it at that. Here is me with my friend Charlotte. 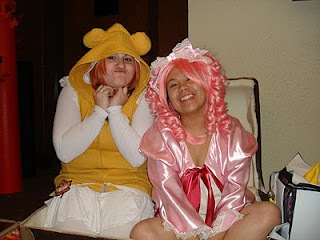 It's Kero from CardCaptorSarkua sharing space with Hinaichigo from RozenMaiden. Hina likes to draw pictures. 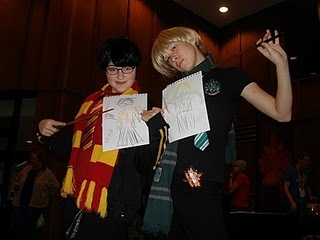 So she got to draw pictures for some SailorScouts, L and Light from DeathNote, and for some Hogwart students.